Come by and learn more about Robotic Process Automation and how it can improve your business. 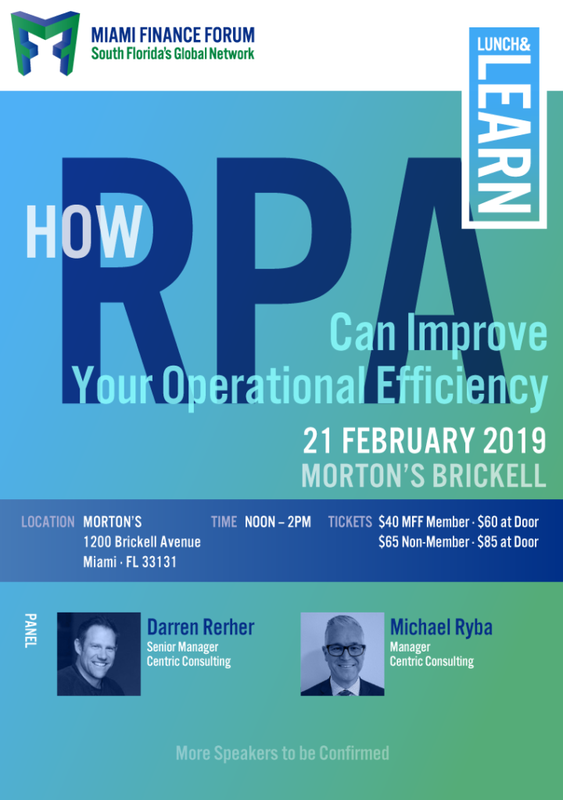 We’re proud to be to sponsoring and speaking at a ‘Lunch and Learn’ presented by the Miami Finance Forum on the topic of how RPA can improve your operational efficiency. We have invited representatives from Vitas to speak about their RPA journey as well. The event will take place at Morton’s Steakhouse on February 21 between noon and 2:00 PM. Darren manages Centric’s Business Process Management (BPM) practice where he supports Centric’s multiple offices with BPM business development efforts, solution methodologies, and best practices. He has led numerous BPM implementations for clients representing financial services, insurance, manufacturing, telecom and retail/grocery companies. Darren also established Centric’s internal BPM Center of Excellence, which included developing standards for delivery methodologies and training materials. He has 20 years of experience managing people, processes, and technology to deliver effective, bottom-line results. This includes leading the implementation of a new product launch process where BPM reduced the product rollout time by more than 50 percent. Darren has also implemented a BPM automated sales quoting process that reduced the process from a 17-day average to a three-day average. 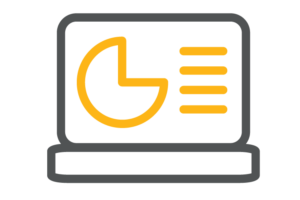 A solutions-driven and strategic IT professional offering over 35 years of Information Technology experience across a variety of industries including Financial Services, Banking, Transportation, and Retail. Roles have ranged from Programmer to Software Development Manager to ITSM Director. A humble leader with a track record of successfully leading software development and IT Service Management (ITSM) process improvement teams. As a Robotics Process Automation (RPA) Developer and Architect, helping to drive the RPA practice at Centric as well as providing oversight and guidance to other RPA Developers in the organization. The Miami Finance Forum is a not-for-profit membership organization comprised of professionals and executives from the world of finance, investment management, banking, capital markets, private equity, venture capital, legal, accounting and related fields. The organization’s main objective is to provide a conduit for its members to meet on a regular basis in order to establish meaningful and relevant business relationships. Through our events, the Miami Finance Forum aims to promote networking and contact among industry professionals, provide its members with educational and career development opportunities, and to create a forum for the general advancement of South Florida as a leading global financial marketplace.